Cover star, author and body positivity advocate Megan Crabbe, has amassed over one million followers on instagram and shares messages about acceptance and eating disorder recovery. Megan’s book, Body Positive Power: How To Stop Dieting, Make Peace with Your Body and Live was published in 2017 and speaks about the widespread nature of negative self-perception. From the subject of personal consciousness to the topic of collective consciousness, Rose McGowan also spoke to Happiful, about her book Brave, exploring her life to date, her time in Hollywood, her ongoing activism as part of the #MeToo movement and the forward looking #RoseArmy, a concept that came to Rose while walking around the city. In addition to interviews with Megan Crabbe, Ruby Wax and Rose McGowan, the mental health focussed magazine features a conversation with Dr Rupy Aujla, articles on emotional labour, body dysmorphic disorder, the impact of words on our psyche, fear of flying, how to manage night-time panic attacks and Toys Like Me - a campaign encouraging toymakers to improve the diversity of their products. The May print edition also includes a special creative booklet. Happiful’s May issue will be on sale from Thursday 18 April. The magazine is also free in e-edition form by subscription at https://happiful.com. For more information about Happiful Magazine or copies of the issue, please contact Amie Sparrow, PR Manager, on 01276 580030 or via email at amie.sparrow@happiful.com or Alice Greedus, PR & Communications Officer, on 01276 580047 or via email at Alice.Greedus@happiful.com. 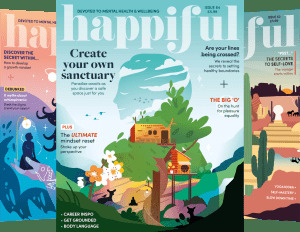 Happiful, the magazine devoted to mental health, celebrated its two-year birthday on Wednesday 20 March 2019 - also the International Day of Happiness. The magazine is dedicated to helping people find the help and community they need - as is Counselling Directory, the first in the Happiful family of directories and resources. Counselling Directory was established in 2005 by sisters Aimi and Emma, who were experiencing mental health challenges themselves. Aimi and Emma wanted to create a resource so others who needed support, like them, could directly access therapy and information about counselling, and take control of their own mental health support. Happiful Magazine was subsequently launched in 2017 and is committed to continuing and de-stigmatising the mental health conversation, and sharing support and personal stories. The magazine is free in e-edition form, as the team believe there should be no cost to accessing the community and support it provides, as well as its inspirational content. On 13 May, a series of five special podcasts will be launched to mark Mental Health Awareness Week and to further the mental health and illness conversation. These were recorded live at King’s Place, as part of Podfest For Mental Health, on Saturday 30 March.